The children of the Williamsbridge NAACP Early Childhood Education Center hosted its annual Black History Month Celebration, as they engaged in songs and poetry written by popular African-American artists. The children made clear their pride in their heritage, as they danced around excitedly. 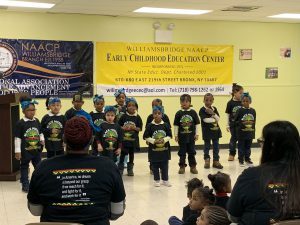 The school, which participates in the city’s UPK (Universal Pre-K) program, for three- and four-year-olds, worked to teach the children about their history and the importance of knowing where they came from. Teachers stressed to the young ones that it should not be just one month out of the year that you celebrate your history. Day Laborers got a win on Thursday. There will be more funding for day laborers thanks to the Northern Manhattan Coalition for Immigrants Rights (NMCIR). The coalition received city approval for a $217,000 contract that will grow their services to struggling immigrants. The approved contract will add funding for training and other support of day laborers. nal Safety and Health Administration (OSHA). The center will do this at its main location in Washington Heights, Manhattan. The $217,000 approved on Thursday is strictly for day laborers. However, the non-profit organization did receive $125,000 earlier this year for education purposes, specifically for its ESOL classes. NMCIR has 1,900 people working with them and half of them are day laborers. The funding in Thursday’s contract is going to help those day laborers. They are part of a program that NMCIR launched in January. Day laborers are generally men, most often from Latin America, who stand in certain parts of the city waiting for contractors or home owners to stop near them and offer they work. They are often cheated out of their expected payments. Cortes said MNCIR is trying hard to get more funding so it can help people on its waiting list. Most day laborers have no formal training, nor do they have a place to meet and seek guidance. In today’s political climate, organizations like MNCIR are continuing to show energetic support for the immigrant community. However, the work that such non-profits do often goes unnoticed by the general public, even while it has a positive impact on members of the community who are off the public radar screen. 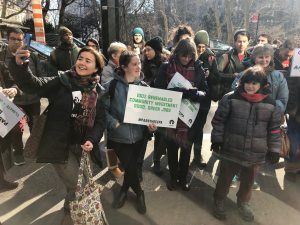 Rally-Goers: We Need Congestion Pricing to Get to Work – and to Survive! “Congestion pricing now!” rally-goers shouted Thursday morning, in the cold weather on the Upper East Side of Manhattan, right across the Queensboro Bridge. According to Figueroa, it is time for drivers to pay their fair shares. And the only way to do that, he said, is by implementing congestion pricing. 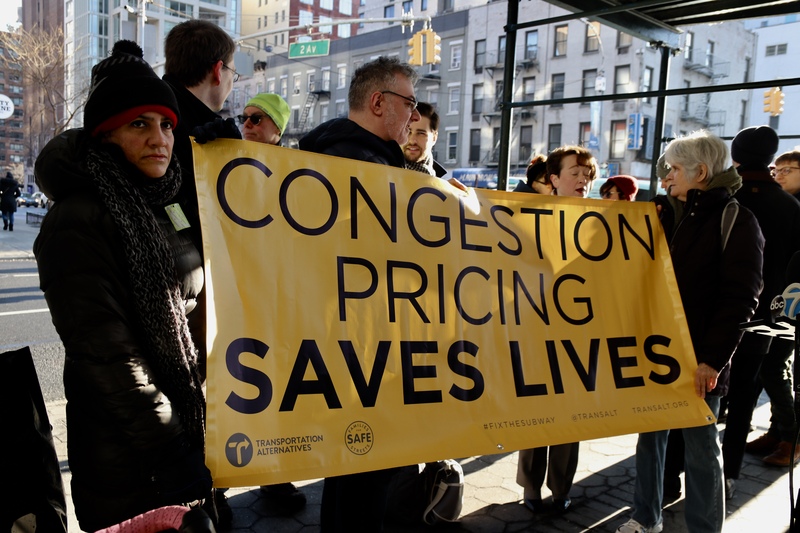 Congestion pricing advocates are suggesting an $11.52 surcharge for cars, a $25.34 charge for trucks, and $2 to $5 per ride on for-hire vehicles entering congestion areas. It is an effort to fix the crumbling mass transit system in New York City. It is notable that both Mayor Bill de Blasio and Governor Andrew Cuomo support the plan. As if to prove a point, Council Member Benjamin Kallos was traveling to the rally on a bus, it got held up in traffic, making him late. 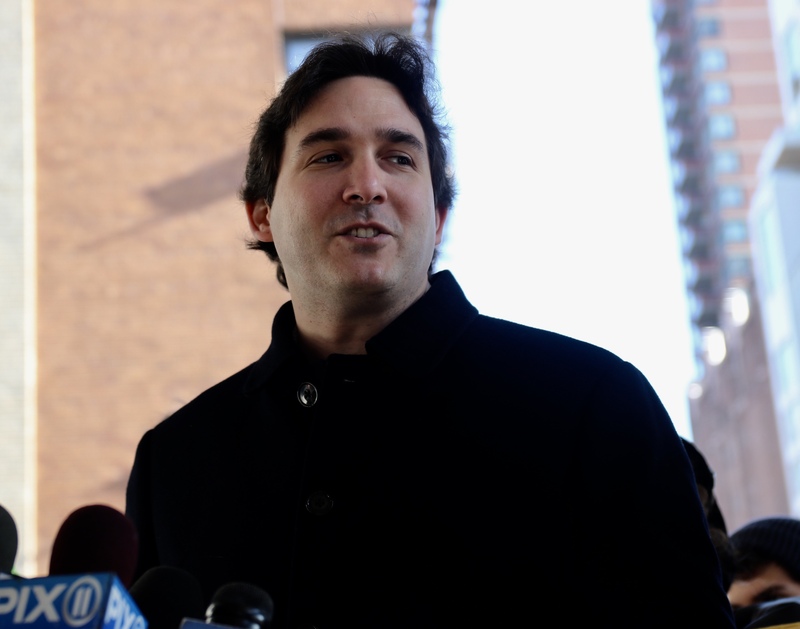 Councilman Ben Kallos. Credit: Zainab Iqbal. As cameramen started putting away their equipment, Kallos appeared. In speaking, Kallos pointed to one of the most dangerous intersections in the neighborhood—the entrance to Manhattan from the Queensboro Bridge. Bridget Cusick, President of Four Freedoms Democratic Club. Credit: Zainab Iqbal. Jeff Gold, co-chair of the Institute for Rational Urban Mobility, agreed. President of Four Freedoms Democratic Club Bridget Cusick said that if political rivals like Cuomo and de Blasio could come together on this issue, why can’t everyone else? Kallos acknowledged that he probably would’ve gotten to the rally quicker if he decided to walk instead. And that’s a problem, he said. Thursday was the grand celebration of a new 231–unit, multi–family affordable housing development in Flushing, Queens, to be known as One Flushing. 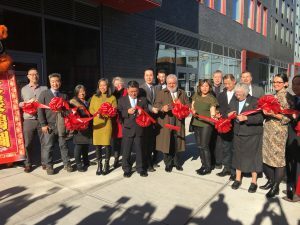 The ribbon–cutting ceremony started off with what is called a “lion dance.” This dance is used in Asian culture to celebrate the Chinese New Year and/or all new beginnings. Asian Americans for Equality Co–Executive Directors Thomas Yu and Jennifer Sun led the event. “Our hope is that our residents will reach higher and give back to the community,” said Sun. She added on that this project will foster the “empowering” of immigrants. “[This is a] boom to the city, and [it] exemplifies the work done together,” she added. “[This project] is a long time coming,” said New York City Councilmember Peter Koo. He said 84,000 applications were submitted for the development. Mothers in New York are excited that the nonprofit organization, MotherCoders, is making New York City its sister home. MotherCoders was founded in the San Francisco Bay area five years ago by Tina Lee. 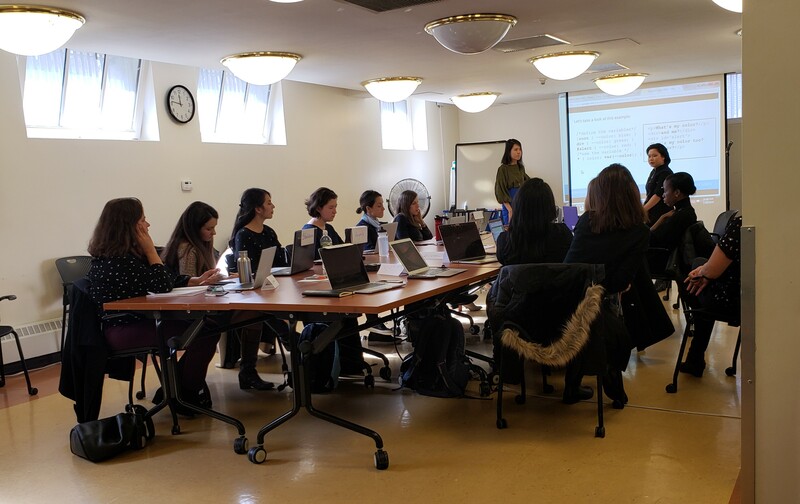 On Thursday, the Macon Branch of the Brooklyn Public Library, located in Bed-Stuy, MotherCoders and Google partnered up to create an opportunity for mothers wanting to learn coding and/or be business owners. This nine-week coding program usually costs about $7,000, but MotherCoders and Google came up with the idea of a scholarship for those mothers who qualify, with childcare also paid for. She spoke to her mentor, Delaine Eastin, who told her, “If you’re not at the table, you’re on the menu.” Her mentor made her realize that if the opportunity wasn’t out there for her, she should create one. Training sessions are being offered at the Macon library on Tuesdays and Thursdays, from 11 a.m. 1:30 p.m. For those mothers not available to attend classes during the weekday, there are Saturday classes from 11 a.m. to 4 p.m. The best part for some is the childcare accommodation, with the children being in the next room. One of the mothers, Nitianu Eastwood Visani, has a 15-month-old son and she has “attachment issues” with him. “Having him next door really helps,” she said. The trial of Joshua Richardson, charged with a second degree murder by Brooklyn prosecutors after he allegedly shot then 34-year-old Stanley Bolden two years ago, began on Thursday. According to prosecutors, the now 30-year-old Richardson allegedly fired five rounds randomly from inside his apartment at 590 Maple St in the Prospect-Lefferts Gardens neighborhood. Official say Bolden was among people in an altercation in front of Richardson’s building. Richardson allegedly attempted to dispose of the weapon he had used, but officers responding to the call found it nearby, in addition to the five shell casings from the weapon. Bolden survived the shooting and checked himself in shortly after to nearby Kings County Hospital, where he was treated for serious, but not life threatening, wounds. If sentenced, Richardson faces 15-25 years in prison. His comments had become public after it was disclosed that his firm was hired by Fox News Channel to investigate claims against Fox News chief, Roger Ailes. Ailes resigned in July 2016 after multiple allegations of sexual harassment. Dietl is a former NYPD detective and presently operates his own private investigation firm, Beau Dietl Investigations, located in Midtown Manhattan. In 2014, Dietl, a former conservative and Republican party nominee, ran in the Democrat primary for mayor against Bill de Blasio. In 2017, he ran as an independent, earning only one percent of the total votes. Assemblywoman Nicole Malliotakis (R.-Bay Ridge, Staten Island) is busy trying to come up with innovative ways to fix the New York City transit system. Malliotakis is working alongside Fix Our Transit, as well as other groups, such as those pushing a MoveNY plan. Malliotakis is a grand supporter of Governor Andrew Cuomo’s congestion pricing proposal. Cuomo wants to charge a fee to vehicles entering Manhattan, in an effort to fix the crumbling transit system. According to Curbed NY, the plan suggests an $11.52 surcharge for cars, a $25.34 charge for trucks, and $2 to $5 per ride on for-hire vehicles entering congestion areas. 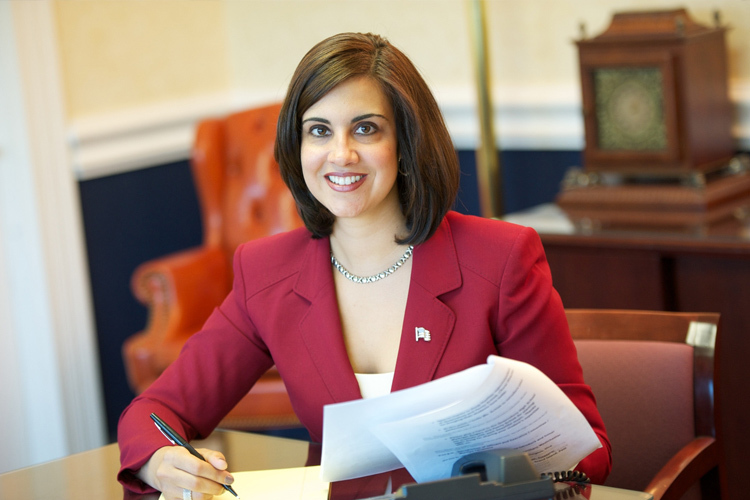 photo: from Assemblywoman Malliotakis’ website. Numbers specifically from the Bay Ridge neighborhood, which includes a number of conservatives, were not available. We reached out to Malliotakis’ office, to get comments about her presentation on congestion pricing, scheduled for Thursday evening, but did not hear back. 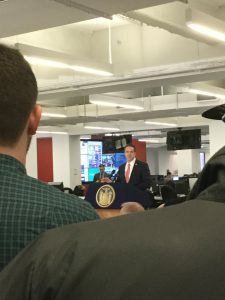 On Thursday, in the Manhattan newsroom of the Daily News, Governor Andrew Cuomo signed the New York Child Victims Act into law. This day marked a special occasion in the lives of the victims who experienced sexual abuse in their childhood. It also was a day to celebrate for the governor, other politicians and activists who advocated for this law to be passed in New York State. Cuomo in the Daily News newsroom. Credit: Shanika Carlies. The fight to get the Child Victims Act passed took a total of thirteen years. Today, many people celebrated the long-awaited victory. “The bill rights the wrongs that went unacknowledged and unpunished…Today says justice is done,” Cuomo said. The Child Victims Act gives more power to the victims of childhood sexual abuse in reporting the crimes and even in suing the perpetrators. It extends New York State’s statute of limitations, which gives victims up until the age of 28 to press criminal chargers to their abusers for felony cases. The previous age limit was 23. It allows victims to file civil actions against their abusers, and the institutions that enabled them, until the age of 55. Open a one year, one-time only period to seek out civil action, no matter how long ago the abuse occurred. Copious congratulatory remarks were made throughout the bill signing ceremony, with much of the congratulations going to the Daily News. The newspaper advocated early on for this bill to be passed, and it shed light in its articles on the abuses children have faced over time, without proper recognitions of the pain they were caused. Marcy Hamilton, a professor at the University of Pennsylvania and leader of the non-profit Child USA, which she dedicates to the cause of child sexual abuse, praised the Daily News’s involvement in this issue. Cuomo and lawmakers hope this act can encourage more survivors to come out and seek justice, even though they know it can be hard to do so right away after a traumatic experience. Throughout the day on Thursday, the New York State Senate Environmental Conservation Committee heard passionate testimonies on the proposed legislation that strives to eliminate human-caused climate change by 2050. The Climate Change Protection Act, CCPA, creates a pathway to what would be the highest standard nationwide for the reduction in gas emissions and pollution. The bill mandates the shift to renewable energy and provides help in this regard for disadvantage communities. It also seeks to provide green jobs in communities that need them. Pro climate control demonstrators outside the hearing. Credit: Tywanna Webb. 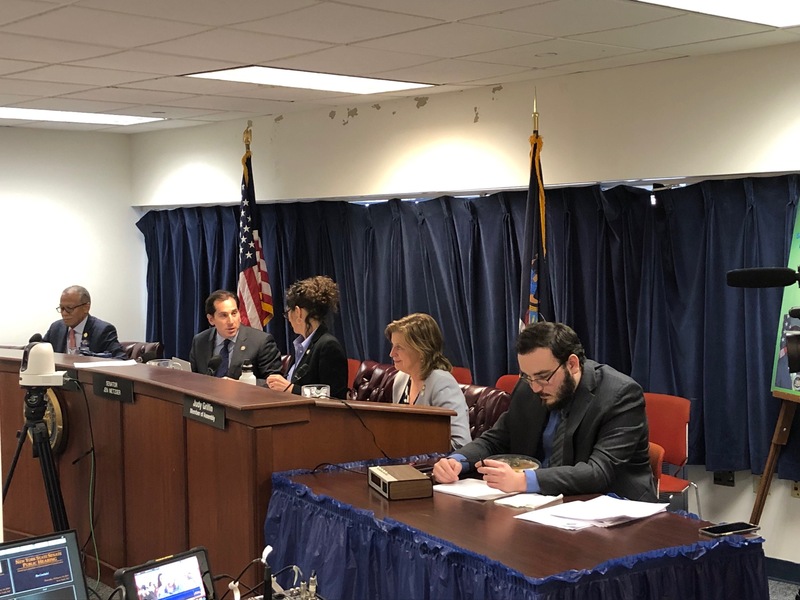 Senator Todd Kaminsky (D) led the discussion, and his colleagues Senator Jen Metzger(D), Senator Robert Jackson (D) and Assemblymember Judy Griffin, were also present. 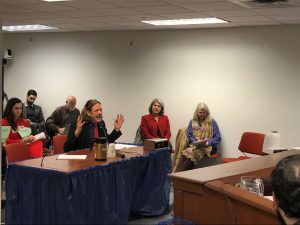 “I’ll tell you honesty Senator, I am scared,” Sandra Steingraber, an ecologist and author who teaches at Itacha College, told the legislators. Steinberg began her testimony with a personal story, sharing that her son had to change his position in her womb in order to be delivered safely. “In order to be born, my son had to radically change his position. He did. In order to survive, we have to do the same,” Steinberg said, emotionally declaring her support of the CCPA. The committee heard over 25 testimonies from members of various organizations, including Rise and Resist, the Jewish Climate Action Network, 32BJ Service Employees International Union, the NYC Environmental Justice Alliance and others. “We need this legislation,” said Dr. Stephen Pekar, a professor at CUNY Queens College and a research scientist at Columbia University. Pekar warned that failure to address rising sea levels will result in further devastation, comparable to the destruction caused by Superstorm Sandy in 2012. The committee strived to hear all testimony, working through lunch to ensure everyone was heard. Outside of the building, supporters of the CCPA rallied to bring awareness to the impact of climate change. Dr. Stephen Pekar, geologist with Queens College testifies. Credit: Tywanna Webb. A crowd of over 50 activists gathered with signs reading #PasstheCCPA. Prior to the Senate Hearing, the group rallied on the steps of City Hall. 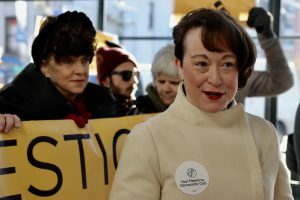 “For many of us, the most important thing is that not only does the bill get passed, but it also gets enforced and implemented quickly because it’s not going to happen overnight and climate change is not waiting for us, “ said Leslie Cagan with the People’s Climate Movement of New York. Support of the CCPA is about equity for groups, including disadvantaged ones, throughout the state, it was said. Left to right, Sen. Robert Jackson, Sen. Todd Kaminsky, Sen. Jen Metzger and Assemblymember Judy Griffin. Credit: Tywanna Webb. Salazar is a member of DEMOS, a policy organization. He said the CCPA “is the boldest climate legislation on the table for New York” and said he hopes that it will pass in the very near future. This is the second of three hearings. The next hearing will take place on Friday in Mineloa, Long Island.